What happens when you flush? Field trip reveals all. City of Port Alberni utilities superintendent Brian Mousley explains the workings of the city’s sewage lagoon to an E.J. Dunn Middle School Grade 8 class last month. Do you know where your water comes from? What about where it goes when you flush your toilet? If the answer to either question is no, try asking your nearest eighth grader. 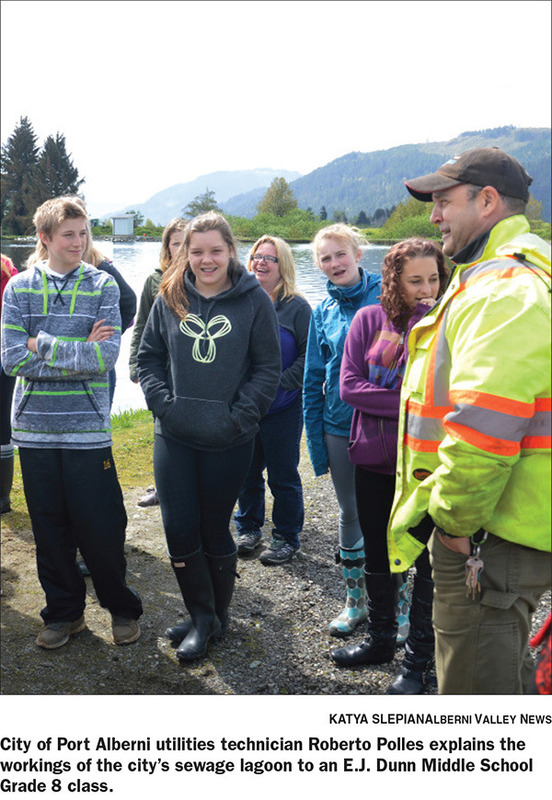 At the end of April, all of School District 70’s Grade 8 students had a chance to see the city of Port Alberni’s entire water distribution system from source to sewer. This is the second year of Source to Sewer, a joint initiative between Mousley and West Coast Aquatic’s Sheena Falconer. Not knowing how the city’s basic utilities function is something Falconer sees as a knowledge gap in the population—not just in school kids. Falconer believes that the lessons about water conservation and respecting the system by which water comes to and leaves from their homes is better taught by the people on the ground rather than just by teachers. For his part, Mousley sees the school tours as a key step in making sure kids understand how limited the city’s water supply really is. It’s certainly given Alisa Clydesdale, 14, something to think about. Exposing students to the behind-the-scenes activities of both the city and an aquatic stewardship organization like WCA opens up the eyes of students like Clydesdale to careers they may have never known existed. “Our society is just in conservation, restoration and preservation of natural systems but we also work with a lot of contractors that build systems for us,” Falconer said.